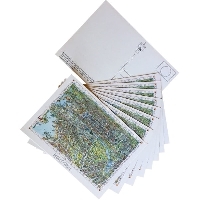 Let's swap a map postcard! This swap is for a store-bought postcard sent naked (no envelope) to one partner. This is a Sender's Choice swap but the postcard needs to have a map of some sort on it. Minimum rating is 4.9. If you have a rating less than this and would like to do a private swap please message us. Hello All, We thought we would just remind everyone that this is an international swap and a Newbie friendly swap. Please allow adequate time for the postcard to make it through the post and please contact your partner before rating 1 (or 3 even?) and give them an opportunity to resend. Treat your partner how you would like to be treated :) :) We will angel - please message us to let us know if the swap didn't work out :) :) Thanks everyone!